The closest star system to the Earth is the famous Alpha Centauri group. Located in the constellation of Centaurus (The Centaur), at a distance of 4.3 light-years, this system is made up of the binary formed by the stars Alpha Centauri A and Alpha Centauri B, plus the faint red dwarf Alpha Centauri C, also known as Proxima Centauri. 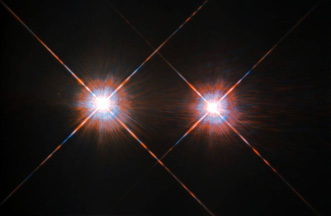 This NASA/ESA Hubble Space Telescope has given us this stunning view of the bright Alpha Centauri A (on the left) and Alpha Centauri B (on the right).